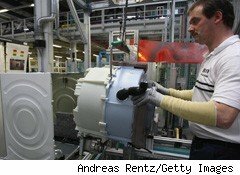 Industrial production rose just 0.1% in June, the U.S. Federal Reserve announced Thursday, providing further confirmation that the U.S. economic recovery has weakened somewhat. What's more, the June industrial production numbers would have been lower had it not been for a 2.7% surge in the utilities sector as electricity producers ramped up their output to keep Americans cool during the unusually hot start to summer. Also in June, mining output rose 0.4%, but manufacturing output fell 0.4% -- the manufacturing component's first decline since February, when widespread snowstorms curtailed activity. Capacity utilization was unchanged at 74.1% in June. That utilization level represents a 5.9% increase from a year earlier, but is still well below its 1972-2009 average of 80.6%. The consensus view of economists surveyed by Bloomberg had been for industrial production to fall 0.2% in June and the capacity utilization rate to dip to 74%. Industrial production rose 1.2% in May. Industrial production rose 6.6% in the second quarter, slightly lower than the 7% gains recorded in the previous two quarters. The capacity utilization statistic is, in a sense, a thermometer that measures the temperature of the U.S. economy. The Fed and economists never expect the reading to hit 100% -- that would mean all factories are producing at peak, 24-hours a day -- hardly a sustainable condition. Rather, readings in the 80-85% range are normal during expansions. For example, during the Roaring '90s expansion of the Clinton years, capacity utilization remained above 80% for almost the entire period. Separately, two, regional U.S. economic surveys provided additional evidence of slowing manufacturing activity. The results of the Federal Reserve Bank of Philadelphia's Manufacturing Survey, commonly known as the Philly Fed Survey, showed the index falling to 5.1 in July from 8 in June. Any reading above zero indicates that the regional economy is continuing to expand, but it is doing so at a considerably lower rate than earlier this year. Economists surveyed by Bloomberg had expected the index to rise to 12 in July. Also, business activity in the New York region slowed substantially in July, as the Empire State Manufacturing Index fell 14.5 points to 5.1, the New York Federal Reserve announced Thursday. Again, the 5.1 reading still indicates that conditions are improving in the region, but at a slower rate than earlier this year. A Bloomberg survey had predicted the index would take a milder dip to 18.0 in July. In sum, those three industrial statistics provide the most compelling evidence to date that the U.S. economic expansion slowed in the second quarter. Economists and business executives alike no doubt hope that this industrial slowdown will prove to have been just a momentary pause, because manufacturing has heretofore led the economic expansion. Construction growth has in the past been a driver of recoveries too, but given the nature of the recent recession, the housing sector is unlikely to serve as a growth engine in the current expansion. The large supply of homes sitting empty or unsold on the market, casualties of the nation's burst housing bubble, only underscores the importance of industrial sector growth in powering the recovery. Whether or not the manufacturing sector strengthens could prove to be the pivotal factor in whether or not we see a robust U.S. expansion in the quarters ahead.